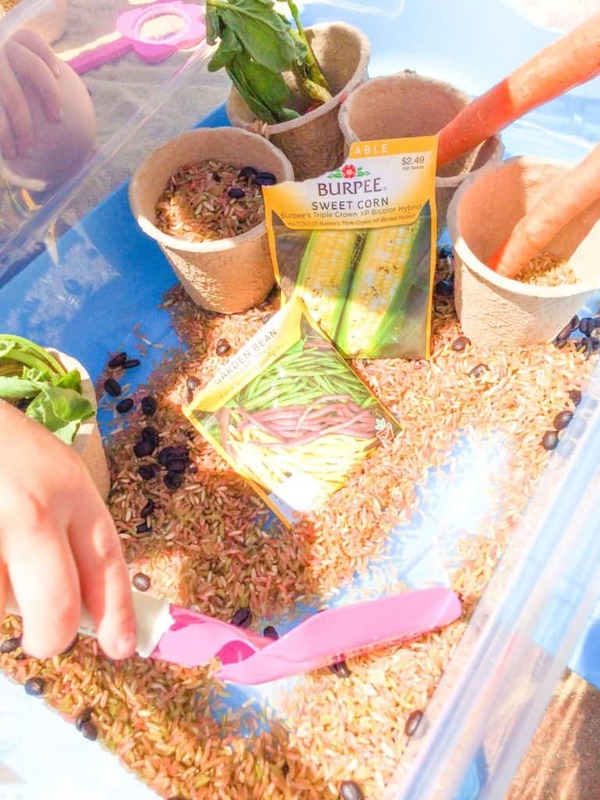 This garden sensory bin is perfect for discussing the importance of gardening and fresh fruits and veggies with kids. What a way to celebrate Spring! 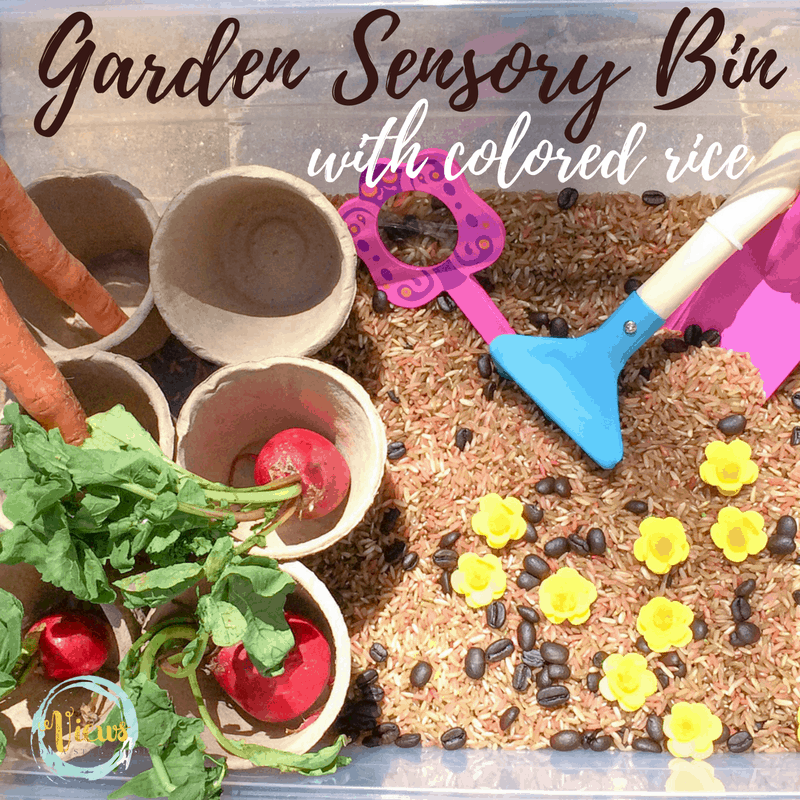 One of my favorite activities to do with my kids are monthly, themed sensory bins. I think the value of sensory play is highly underrated, kids can learn SO much by simply engaging all of their senses when exploring the world around them. 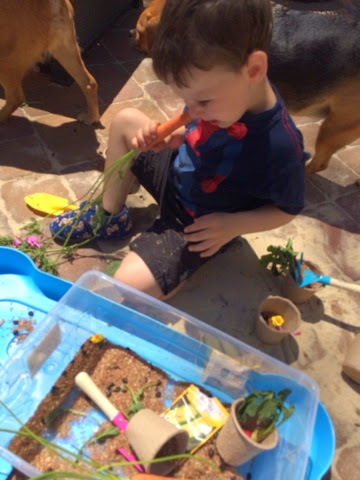 This garden sensory bin definitely prompted some tasting of vegetables! I don’t think there is a mom in the world that would argue with the importance of that! I like to start with bases such as rice, lentils, beans etc. Whatever material you think would feel good running between your little one’s fingers you go ahead and use! 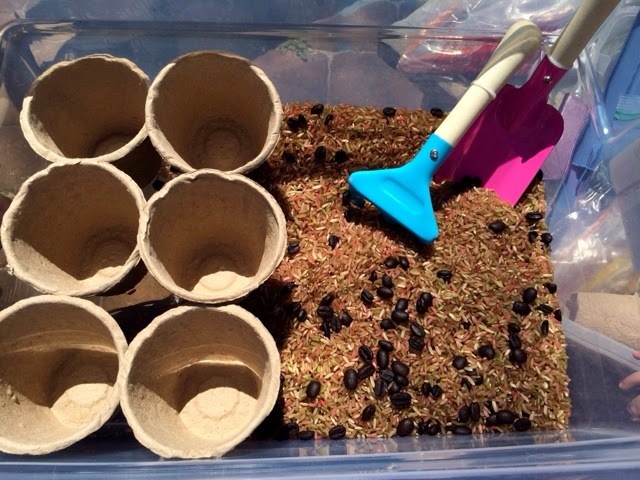 I wanted our base for this bin to resemble dirt so I started with brown-colored rice. 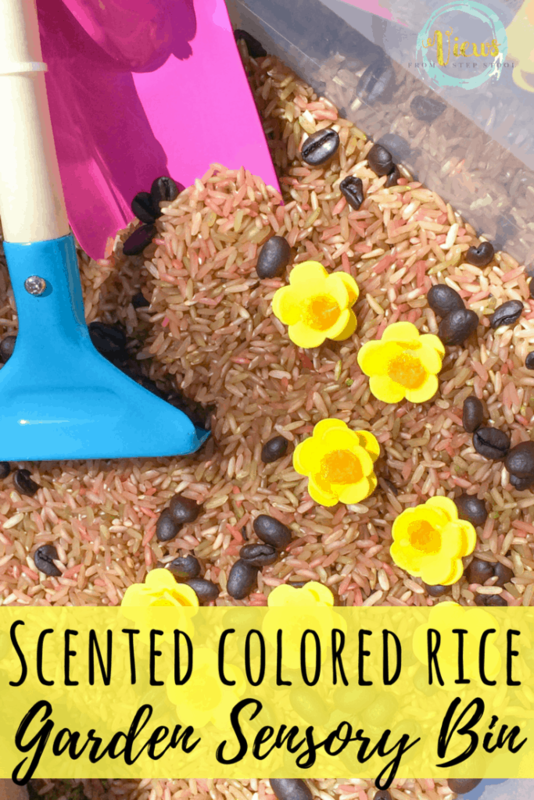 Making colored rice is so easy and fun for kids to do so it is always a good starting point. M loves color mixing so was thrilled when we got to mix green and red to make brown rice. There is a variety of ways to color rice but we like to use a couple pumps of hand sanitizer with some drops of food coloring. It’s easiest to mix all of that in a large ziploc bag and have your child shake it like crazy! The results are instant and never get old! I also happen to love the clean smell that the saniziter gives the rice. For more detailed instructions check out Not Just Cute’s basics of coloring rice. For the basics of this bin I used our colored rice, some coffee beans (for fantastic smell), biodegradable plant pots and kid-friendly shovels and rakes. 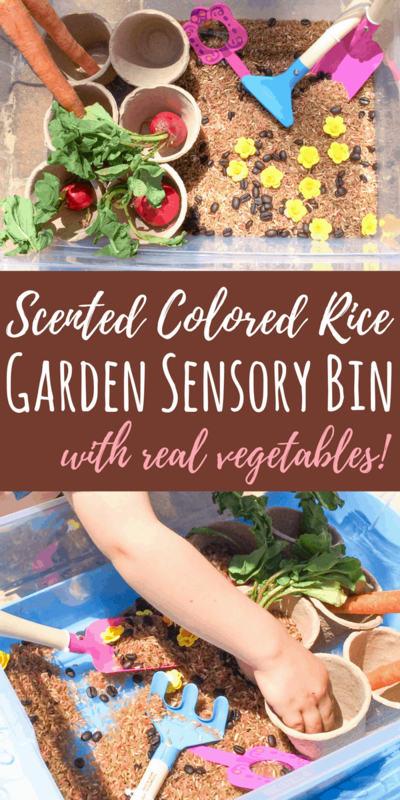 The only things I needed to purchase for this bin were the pots and a new shovel and rake, all of which were in the dollar section at Target…so outside of normal pantry items and things I had in my sensory stash I only spent $3, not bad for a month’s worth of imaginative sensory play! I found these great little foam flowers (I think they are technically for scrapbooking) in my closet that I thought M would enjoy planting. I like to peruse the clearance aisles of craft stores and stock up on these types of things. They seem to always come in handy! We also used them for our Spring sticky wall. 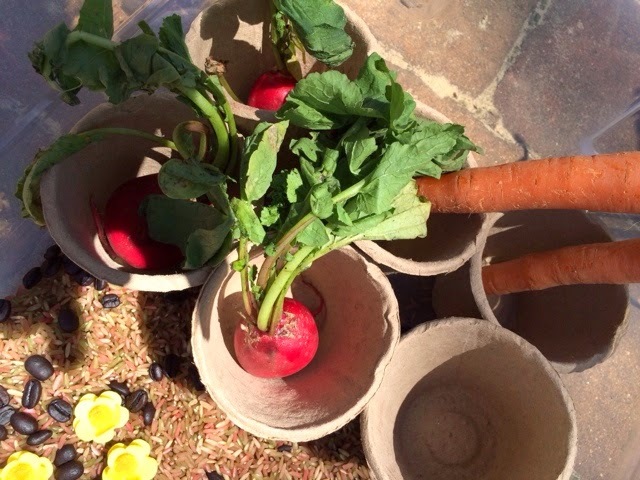 To the pots I added some fresh carrots and radishes that we purchased on a trip to our local orchard! 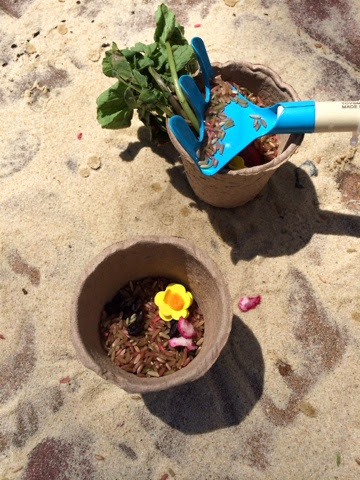 M had SO much fun ‘planting’ these, they really took the bin to another level. I also added the rest of the beans and corn seeds that we had leftover from our egg carton garden starters. 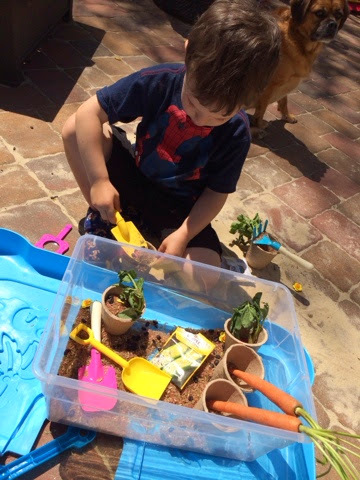 The kids LOVED playing with this garden sensory bin! Another bonus of this bin is that is can be played with outdoors! I love that I can just sweep the rice away! 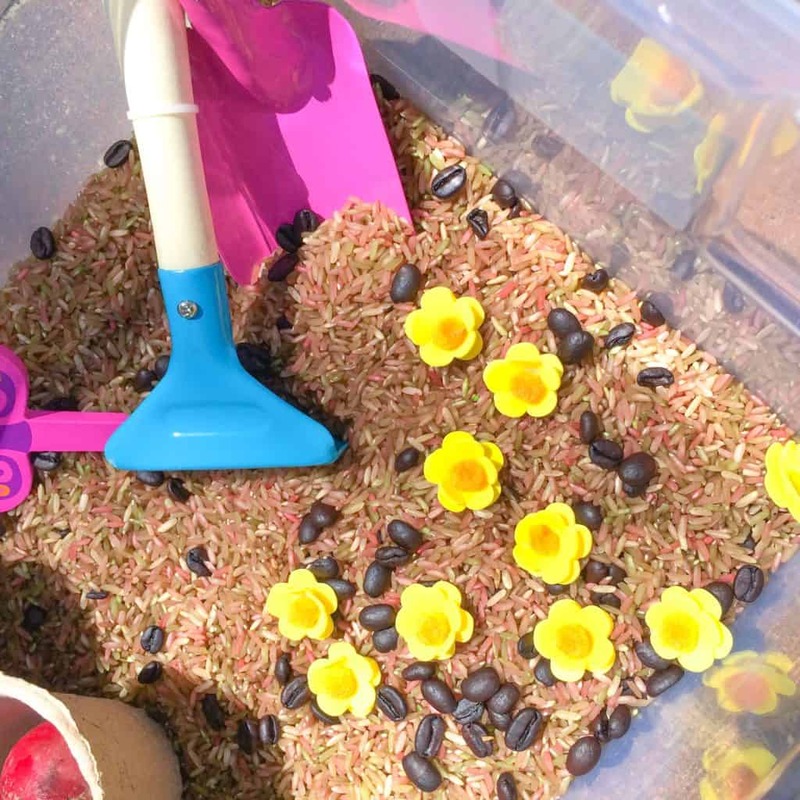 I have also seen some great outdoor bins that include items such as bird seed from My Nearest and Dearest and Frogs, Snails and Puppy Dog Tails, genius! 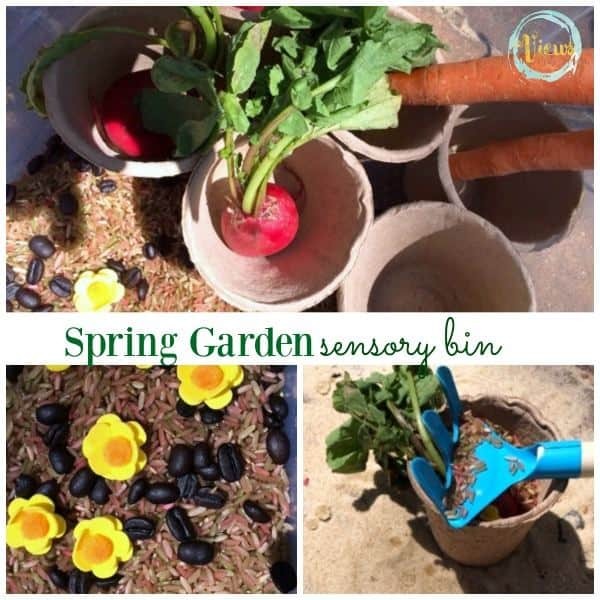 For more sensory ideas follow my Sensory Play board on Pinterest and check out these ways to start seeds indoors from recycled materials!